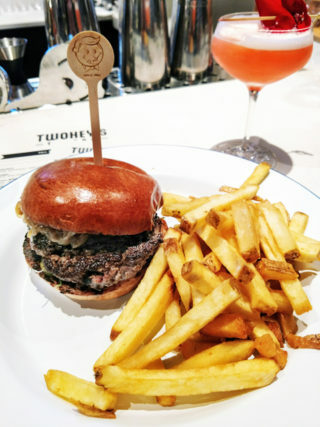 The Stinko Burger at Twohey’s Tavern, Sunday, November 19, 2017. Pasadena’s Cheeseburger Week is January 7 – 12, 2018. 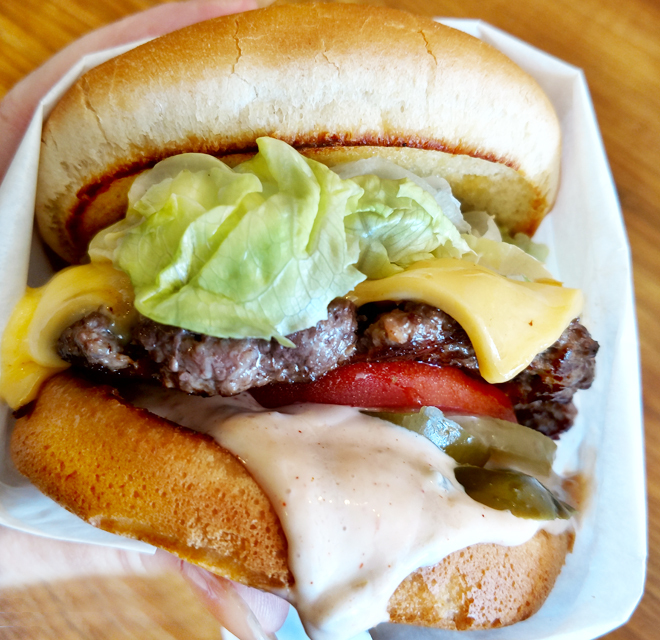 From vintage burger shacks to fine dining, from taverns to turnkeys, from all beef to 50/50, or from turkey to vegetarian—and everything in between—cheeseburger lovers will be able to vote for their favorites in a number of categories from now until Friday, Jan. 12, 2018 during this week’s Cheeseburger Week and the Cheeseburger Challenge for 2018. A classic cheeseburger at Pie n’ Burger, Wednesday, October 25, 2017. Pie n’ Burger is a participant in the 2018 Cheeseburger Challange for Cheeseburger Week, January 7 – 12, 2018. Pie ‘n Burger is local-famous for its traditional burgers, including the tried-and-true American Cheeseburger. The modest restaurant, a Pasadena landmark, serves up a variety of Americana comfort food, table and counter-served since 1963, where the restaurant still uses a vintage working cash register. But if you find yourself looking into the savory pie on the menu, just trust me and skip the Chicken Pot Pie this time. For the 2018 Cheeseburger Week special meal—a cheeseburger, fries and a soft drink—is $13, and you can download the coupon here. Twohey’s Tavern, of Twohey’s Alhambra Stinko Burger fame, serves up a traditional American as well as their own famous Chili Dip burger made with house chili, Grafton cheddar, onion sprouts, crème fraîche and a side of those crispy house fries, as well as their Stinko 2.0. Here is the list of participants for 2018. Voting in the 2018 Cheeseburger Challenge ends Jan. 14, 2018. This entry was posted in Events, Food and tagged BluRoom, Cameron's Seafood, Central Park Restaurant, Clearman’s Galley, Del Frisco's Grille, Dog Haus, Du Pars, Dusit D2 Hotel Constance, Edwin Mills by Equator, El Portal, Gale’s, Green Street Restaurant, Kathleen's Restaurant, Kings Row Gastropub, Lucky Baldwin’s, Pie ‘n Burger, Plate 38, POP Champagne & Dessert Bar, Robin’s Wood Fire BBQ, Rounds Premium Burgers, Ruth’s Chris, Slater's 50/50, Taproom at the Langham, The Counter, The Stand, True Food Kitchen, twoheys tavern, Umami Burger, Vertical Wine Bistro, White Horse Lounge, whole foods market, Yahaira’s Cafe. Bookmark the permalink.